The Sinclair Oil Corporation has been around since May 1st, 1916 when Harry Sinclair combined eleven different petroleum companies into one. In 1930, the corporation chose as its logo a silhouette of a large green dinosaur, at the time known as a brontosaurus. This cute green dinosaur is the company's mascot and it made its first appearance at the Chicago World's Fair in 1933 - 1934. Over the next several decades, Dino, the brontosaurus mascot would make many other appearances, often with his friends, other dinosaurs including a T-Rex and a Stegosaurus, among other dinosaurs species. Some of these dinosaurs are still on display at Dinosaur Valley State Park in Texas. 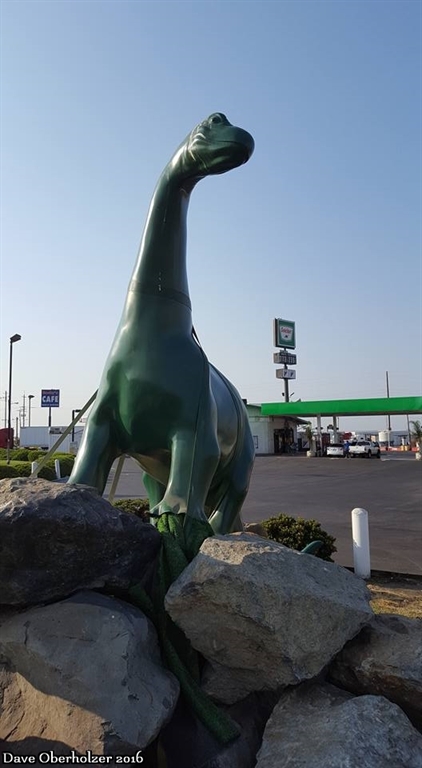 By the sixties and seventies they had several fiberglass statues made by International Fiberglass of their green sauropod, placing them at various service stations. International Fiberglass made them in two different sizes - a 12 foot long, 4 and 1/2 foot wide, 85 pound version and an 8 foot, 3 and 1/2 foot, 60 pound version. Since Sinclair did not have an exclusive contract with International Fiberglass, as long as the dinosaur was painted a different color, the company could sell the same type of statue to other buyers, and often did, causing non green Sinclair Dinosaurs to appear in places like miniature golf courses. After International Fiberglass no longer operated and Sinclair decided to make more fiberglass mascots, a mold was taken from an existing statue. Although pretty common in other states, especially Colorado, these green fiberglass statues, until recently, had very little presence on the West Coast. California only had one Sinclair Dinosaur, a colorfully painted relic probably from a former service station that originally was located at a Shoe Biz store in San Francisco. I'm not even sure he was an actual Sinclair Dinosaur, but he had resided at the store on Haight Street since 1975, often changing colors and declaring that no one sit on him. Sadly he was stolen at the end of January 2016, but was returned anonymously all repainted. The location is a different business now. 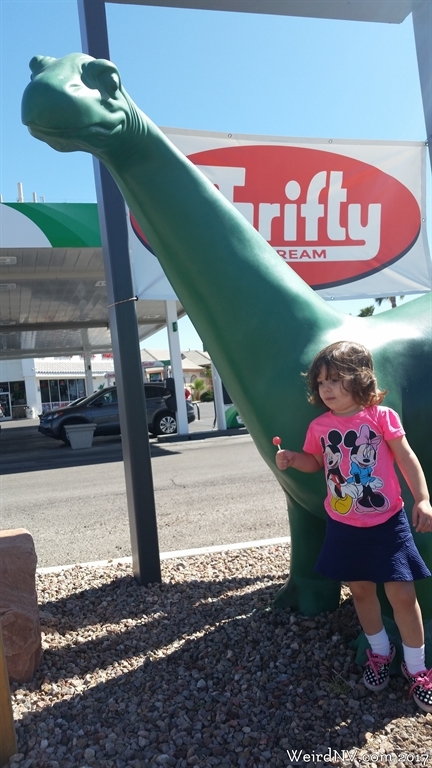 But luckily for lovers of fiberglass dinosaurs, over the past few years there's been a return of Dino, the Sinclair Dinosaur, to both California and Nevada as both states have seen more Sinclair branded service stations slowly popping up all over the place. For example, in California, in 2013 a Union 76 station in Lodi changed into a Sinclair Station and received a genuine Sinclair Dinosaur. He sits perched up on a rock pile. In 2014, a Shell station in Chico changed into a Sinclair Station and also received a genuine Sinclair Dinosaur. 2015 saw a new Sinclair Station in San Pedro, also with their own dinosaur. 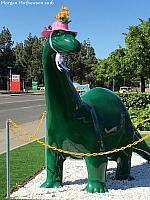 The Fairfield Sinclair Dinosaur wears a hat! Not surprisingly, Bell Plastics in Hayward acquired a Sinclair Dinosaur in 2016. Bell Plastics is known for its multitude of fiberglass statues including several Muffler Men, Doggie Diner heads, and other fiberglass giants! The owner, Bruce Kennedy, collects fiberglass statues. They have a small Sinclair Dinosaur proudly displayed up on a pole, looming over several other fiberglass statues. Along Interstate 15 is Hesperia, which once had a Sinclair Dinosaur. Sadly, it wasn't there very long. 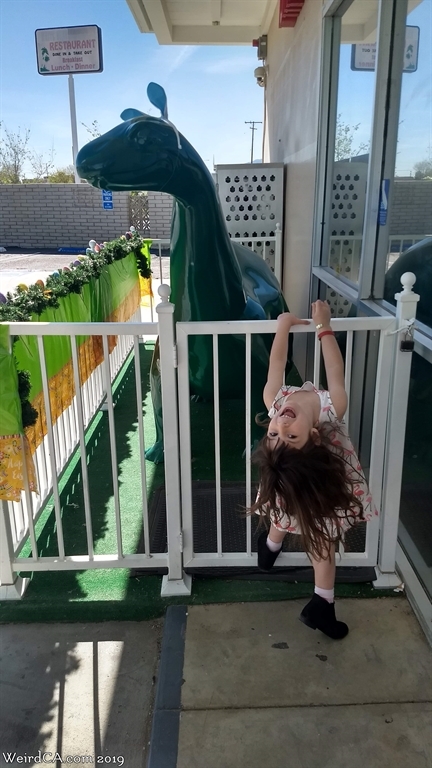 Their Sinclair Dinosaur was located behind a low white fence in front of the convenience store portion of the service station appropriately called "Dino Mart". It was freshly painted and in great condition. It is the only dinosaur I've seen besides the Bell Plastics one that has the head coming off and to the right, rather than the left. The service station closed in either late 2018 or early 2019. The dinosaur is now gone. Although the Sinclair Station in Hesperia has closed, 25 miles east of it, in Lucerne Valley, another Sinclair Station has opened. The setup is the same. A Sinclair dinosaur with the head going off to the right located behind a white fence in front of the convenience store portion of the location. It's almost exactly the same as the Hesperia location. I'd almost say that they just moved the dinosaur down the street 25 miles. When I stopped by, the dinosaur was celebrating Easter by wearing some bunny ears on its head. Eggs were also draped on its white fence. Poor Man's Bronze in Jackson has a replica of a Sinclair Dinosaur that hangs out there, possibly also with a giant chicken. In addition, we've also identified Sinclair Dinosaurs in Auburn, Campo, Farmersville, Indio, Livingstone, Placerville, Williams and Yuba City! You can see Cole Lundsten showing off the Williams Sinclair Dinosaur! It is perfectly placed to get the city's name bearing arch in the background. Not to be outdone, Nevada is also getting into the act of harboring Sinclair Dinosaurs. I have found three different dinosaurs in Las Vegas alone, plus I've seen one in nearby Boulder City. One of the Las Vegas dinosaurs appears to have been at the station for a fair amount of time, the others appear relatively new or brand new. I anticipate more appearing in the city soon. Although most of the Nevada dinosaurs appear to currently be clustered in Clark County, the small town of Verdi, west of Reno, along Interstate 80, near the California border also has one. As does the towns of Alamo and Caliente northeast of Vegas. Alamo's dinosaur is often decorated for the holidays. So as more dinosaurs migrate into the states of California and Nevada, we'll be on the look out for them! Please let us know if there are more than the ones we've listed below and, of course, we can use pictures of several of them! Sadly there exists Sinclair Gas Stations that DON'T have a dinosaur. We do not understand the point of such a station. I mean who would want to fill up their car with gas and not get to enjoy a small green dinosaur? Additionally, Dino was seen in the Macy's Thanksgiving Day parade in 2015, the first time since 1976! And remember that comedy television series in the early 1990's called "Dinosaurs" which starred a family of dinosaurs called the Sinclairs? Well, I'm sure you can guess where their name originated from. Williams photo courtesy of Colean Lundsten. 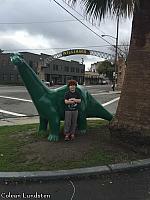 In Chowchilla, CA, there is an old mini mart on Robert's Blvd., aka Highway 233, that has an old Sinclair dino. The next time we are down there visiting my dad, we will get a photo. We forgot last time because we couldn't wait to get home as the kids were out of control. There is a Sinclair dinosaur located at the station in Goldendale, Washington. I love those Sinclair dinosaurs. We just got a Sinclair in Paso Robles, CA, however, our location does not have a dinosaur..but we want one!